Are you looking for a company that supplies advertising columns? You have come to the right place. Advertising columns can make your shop or company stand out. Advertising columns are the perfect eye-catchers in places where a lot of people pass by. Think of a LED TV screen on an empty shop front, a billboard along the motorway or a canvas light box in a shopping centre. We can produce any advertising column for you. Large or small, illuminated or unlit, integrated with digital clock or news ticker – whatever you want! 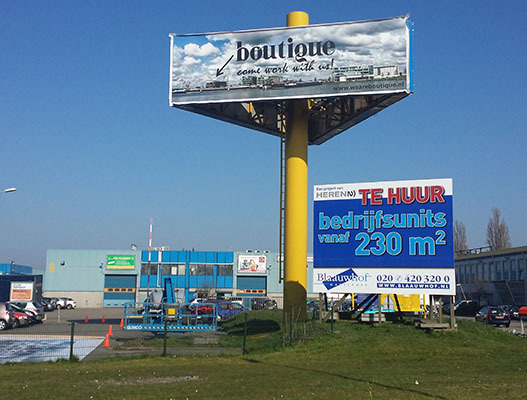 Benelux Sign Systems offers you numerous possibilities in terms of advertising columns. Advertising columns that are fully custom-made, with materials of the highest quality. How to order advertising columns? 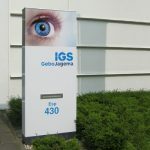 Benelux Sign Systems offers you numerous possibilities in terms of advertising columns. We can produce these in various sizes, colours and heights and always deliver custom-made solutions. Please contact us with your requirements. We will map these out and draw up a quotation without obligation. Would you like to use our services? We can start of by creating a design. If you haven’t already provided this yourself, we can also make it for you, or give you advice. After having received your approval and confirmed your order, we will proceed to the production of the advertising columns. Once completed, we will deliver them to your door. If required, we can assemble the advertising columns for you. 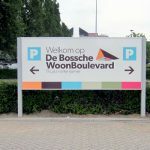 Benelux Sign Systems has been specialising in front lettering for some time now. For the last 35 years we have continued to grow more and more into a professional specialist in the field of formula design and illuminated advertising. We maintain many long-term relationships with various customers and deliver beautiful projects to great satisfaction. Benelux Sign Systems can advise you on a design if you want to buy advertising columns. We can create the design for you and produce it. If required, we can assist you with the assembly and maintenance of the advertising columns. 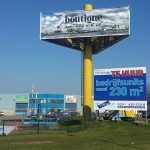 Want to know more about what Benelux Sign Systems can do for you in terms of advertising columns? Please feel free to contact us. You can call us on (040) 283 69 30. Or send an email or fill in the contact form on the website. We would like to discuss your requirements and our available options. Buy your advertising columns from Benelux Sign Systems!